Choosing a bass guitar isn’t easy, mainly for two reasons: usually, the guitar you want isn’t necessarily in your budget and guitar manufacturers keep getting better at producing high-quality instruments at lower prices, which means that there are too many guitars to choose from! There are so many different choices out there that when it comes time to start shopping around for a new bass guitar for yourself, it can honestly start to get a little too overwhelming. Don’t worry, that’s where I come in! 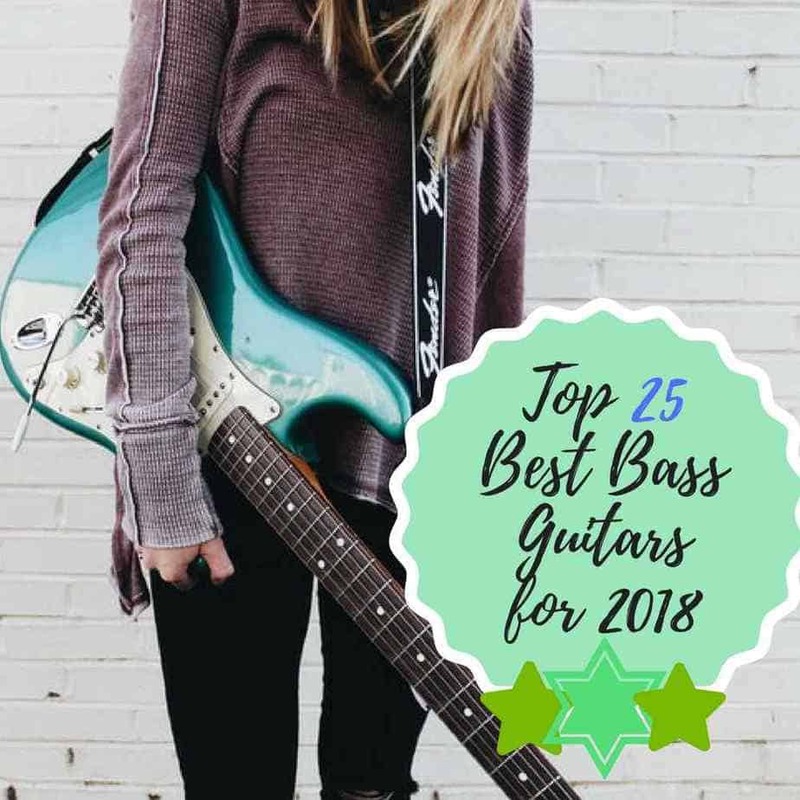 Today, I have created a list of the top 25 best bass guitars for 2018 for you to choose from. All of these guitars have been handpicked and sorted into different categories depending upon your skill level, your personal music tastes, and your budget. Whatever your budget may be, a great quality electric bass guitar is going to be available to you. You just have to know what to look for in a bass guitar and which guitar will suit your playing style the best. There are a whole bunch of different things that go into making a great bass guitar, but the things that make a great bass guitar for you may be things that make a bass guitar mediocre for other musicians. But, one of the main components that go into creating a great bass guitar is the choice of woods that are used to make the body and the neck of the guitar. On cheaper bass guitars, you’re going to find bodies comprised of basswood or alder; the more expensive the guitars are, you’ll begin to find other woods incorporated, such as maple, swamp ash, and mahogany. While the woods used on your guitar shouldn’t be the defining point of the choice you make in your guitar, they should be one of the reasons that you do look into specific guitars. How to find a good bass guitar? Make sure that when you’re shopping around for a guitar, that you do your research for all of the benefits that a specific type of wood has to offer to you. As an example, guitars that are comprised of swamp ash produce a bright sound, whereas guitars that are comprised of mahogany will provide musicians with a warm sound. You should also take time to research the type of wood your guitar is comprised of for your physical benefit; if you plan on traveling with your bass guitar and spending a lot of time standing on stage, you should look into a guitar that’s made from a lighter wood so it not too heavy for you to play. At the end of the day, no matter what the woods, the electronics, the pickups, or how many strings your bass guitar has, you shouldn’t face any instrument with any prejudice. Pick your bass guitar based off of what you think sounds best, regarding instruments in your budget. You can’t go wrong with a bass guitar that you enjoy the sound of! What’s the difference between active pickups and passive pickups? 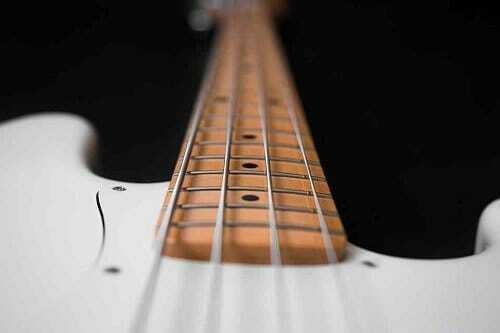 The type of pickup that your bass guitar has will also define what type of sound your instrument produces. If you are a musician who is looking for the classic warm, vigorous sound with a dynamic range of tonal production, you’re going to want to look for a guitar that has passive pickups. However, if you get your hands on a bass guitar that have a set of active pickups installed, you’re going to get yourself bright, clear, bell-like tones. These tones will be especially prevalent if your guitar comes with built-in preamps, as the overall volume output is larger when being compared the overall volume output of a passive pickup. Active pickups are typically a favorite in the guitar community, typically because they also don’t have to interact with a lot of interferences or background noise. When coming time to choose your bass guitar, the choice of an active or passive pickup will be a choice you’re going to have to make based on your personal preferences. As said earlier, make sure that you play around with a few different guitars before making a final decision on any one instrument. Again, it’s really all up to you on whether or not you’d like to purchase a new or used bass guitar. When you purchase a new bass guitar, you’re more than likely going to have the security of a warranty from the company. On top of purchasing a new bass guitar, you’re also going to be purchasing the full set-up, so you’ll be ready to start playing as soon as you’ve completed your purchase. Purchasing a used bass guitar, no matter what the price tag is, is going to be a bit riskier. However, this risk can be a great payoff if you end up purchasing a gem of a bass guitar and didn’t have to spend a whole lot of money on it. If you do happen to be purchasing a used bass guitar, make sure that the purchase is going through an online or physical guitar store that has a good reputation. Getting an instrument from a flea market, yard sale, eBay, or thrift store can be a lot larger of a risk, especially if you aren’t able to test out your instrument when it’s hooked up to an amp and you won’t have the ability to make returns. The best piece of advice that I give to all musicians who are looking to purchase a new guitar is to take some time and try out a whole variety of different guitars to find an instrument that you truly love. While a new guitar may be a little more expensive in the beginning, if you end up purchasing a used guitar from a seller that isn’t reputable, you can be out hundreds or thousands of dollars by trying to make repairs on a mediocre guitar. The solid swamp ash body that’s paired with an oval pickguard is the most visually striking parts of this bass guitar, while also providing musicians with an incredibly wide tonal variety. The ‘C’ neck on this guitar also makes this instrument easy to play for a long period of time and doesn’t cause the hand to feel too worn. The RAY34’s sound is expressed by a single passive bridge humbucker that’s paired with a 3-band preamp. This combo really allows this instrument to have a punchy sound. If you’re not really worried about the price tag on your bass guitar, the Fender Deluxe Active P Bass Special is a premium bass guitar worth the cash. This is one of the best bass guitars on this list and the price tag certainly does represent that. The Fender Deluxe P-Bass Special has a classic Fender styling with a solid alder P Bass body, paired with a satin-finished modern ‘C’ shaped maple Jazz neck. Fender installed two vintage noiseless pickups in this bass guitar, a Precision Bass pickup in the middle of the guitar and a Jazz Bass pickup located at the bridge of the guitar. Cort is a guitar manufacturer that’s well known for their budget instruments, but Cort does produce a handful of guitars that are on the pricier side. The Jeff Berlin Rithimic Bass Guitar is comprised of a double-cutaway alder body with a Padouk and Spalted Maple veneer top, which is a combination that’s pretty rare to find on the market. This bass guitar also has a Canadian hard maple neck, with a rosewood fretboard, and 21 frets. The hardware on this guitar is only the highest quality, as two Bartolini Jeff Berlin Custom Soapbar pickups placed at the bridge and the neck of the guitar, with a set of gold-plated controls, a set of Hipshot Ultralight tuners, and a Basics Full Contact FCH4 bridge, which are all of outstanding quality. Schechter originally becomes famous for producing guitars that were incredibly elegant but were still affordable for most musicians. The Schechter Stiletto Custom 4 is comprised of a variety of different woods with a double cutaway mahogany body and a figured maple top, plus a walnut and maple combination multi-ply neck. There are two EMG 35 HZ pickups located at the bridge of the guitar and the neck of the guitar, with a two band EMG Active EQ. This combo provides the guitar with a punchy low end and a smoother high end, which gives it the perfect overall sound for metal. If you’ve heard of Yamaha’s TRBX bass series, The TRBX174EW is on the lower end of the spectrum in this series from Yamaha. When my eyes first landed on this guitar, I was very intrigued by the overall look of this guitar, as it is unique looking. There is a layer of exotic mango wood on the top of this guitar, which I hadn’t yet seen in other guitars yet. The majority of this guitar is comprised from mahogany and is paired with a bolt-on maple neck with a rosewood fretboard and 24 frets. The TRBX174EW bass guitar has a split precision style single coil humbucker and Jazz style single coil humbucker. The Yamaha TRBX305 is a bass guitar is comprised of a solid mahogany body that’s finished a black nickel and comes installed with Performance EQ active circuitry, so musicians are able to quickly and effectively personalize the tones that this bass guitar produces. The body of this guitar is balanced very well and even has a thumb rest so you can comfortably rest your hands while either playing finger styles or slap bass. The Thunderbird bass guitar is a fan favorite from Gibson, so Epiphone went and decided to make their own version; the Epiphone Thunderbird Pro-IV bass guitar. The Epiphone Thunderbird ‘wings’ or ‘ears’ are comprised of solid mahogany and has a seven-piece through-body neck that’s made from a combination of maple and walnut. From my personal experience, I found that this neck was extremely comfortable to play, as it has a Slim Taper profile, a rosewood fretboard, and 20 medium jumbo frets. There are two battery-powered Epiphone T proactive bass humbuckers placed at both the bridge and the middle positions, which really provide the overall sound of this guitar with a lot of power. The first time I ever picked up the Squier Vintage Modified Jaguar Bass Special SS, I fell in love. I am a person with small hands and I truly felt comfortable playing this bass guitar with its 30-inch scale length. The body of this bass guitar is comprised of agathist and comes with a bolt-on maple neck, with a rosewood fretboard, and 20 frets. Personally, I wasn’t super impressed with the pickups that are installed on this guitar and they weren’t as strong as I’d expected them to be, but they do a great job especially when considering the price tag. There is a split single coil precision bass pickup in the middle of the guitar and a single coil Jazz bass pickup that’s located at the bridge of the guitar. The Squier Affinity Series 5-String Jazz V Bass Guitar features a double cutaway that’s comprised from solid alder, with a bolt-on ‘C’ neck that’s made from maple, paired with a rosewood fretboard and 20 frets. This guitar does come with two Jazz Bass V single coil pickups, one placed at the bridge, and the other placed at the middle of the guitar. My biggest complaint about this guitar was that the overall appearance of the hardware wasn’t the most stunning I’ve ever seen before, but it does get the job done. The Squier Classic Vibe Precision 50s Bass Guitar is a bass guitar that’s well-known for being super smooth to play. This bass guitar was built with the 1950s-vintage bass guitar look in mind, but still has all of the modern accessories that a modern bass guitar players needs to successfully play the bass guitar. Classic Vibe Precision 50s Bass Guitar has a DiMass four saddle bridge, which makes setting up your guitar super easy to do and playing your guitar even more fun. This instrument has a warmed earthy-tone that’ caused by the larger neck of this guitar. There is also a wider string spacing on this instrument, which really adds to the overall classic 50s look and feel. 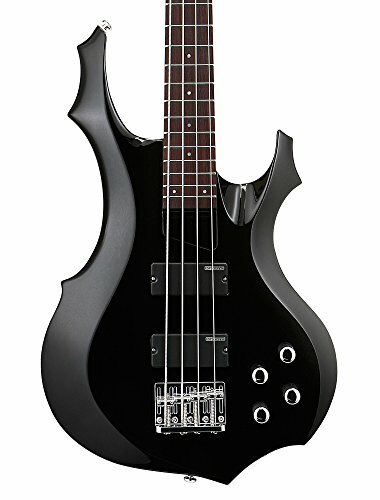 The Epiphone EB03 is one of the more popular bass guitars among beginners, because the Epiphone EB-3 pays attention to vintage bass guitars, but looks much more modern with a long scale neck. This instrument is comprised of a mahogany body, mahogany neck, Sidewinder humbucker pickup located at the neck, and an NYT Bass mini-humbucker pickup located at the bridge of the guitar. The Washburn Taurus T24 has a neck-through design and is comprised of fine tonewoods, such as a mahogany body, a maple and mahogany combo neck, and a rosewood fingerboard. As for the neck of the guitar, the Washburn has a neck that is thin and makes for a fast playing neck. The Custom JJ pickups allow the musician to achieve from a variety of different tones, from throaty lows to punchy trebles. 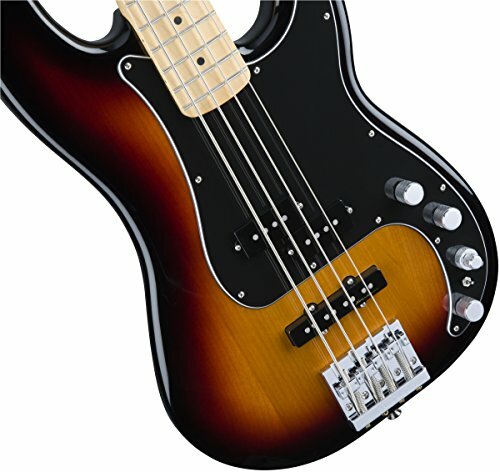 This bass guitar was specifically designed for the modern musician in mind, as Fender really provided modern-day musicians with modern bass technologies. The Modern Player Dimension Bass has a five-position rotary pickup that allows musicians to really experiment with their tone from the three-coil pickup, by choosing from the front oil, the front and the middle coil, etc. If you’re looking for a bass guitar that produces a real, authentic bass guitar sound, all with an affordable price tag. The Squier Jaguar Bass V Special is cosmetically appealing, has a great vintage style, and a high-quality sound that’s produced through the Fender single coil Jazz Bass V dual pickups that are placed at the middle and the bridge of the guitar. The Schechter Guitar Research Stiletto Extreme 4-T is comprised of a cutaway mahogany body with a maple neck and a maple top. There are two Schechter bass Humbucker pickups and an active EQ installed on this guitar, which really allows musicians to stay in complete and utter control of the sound that they’re producing. When I first began playing the ESP F-104 bass guitar, I was honestly really impressed with this instrument and almost in a state of awe. The F-104 has a fast neck, a real deep, thunder-like sound, and chrome hardware. The ESP has SB-4 pickups with an active HQ that really make this bass guitar incredibly versatile. 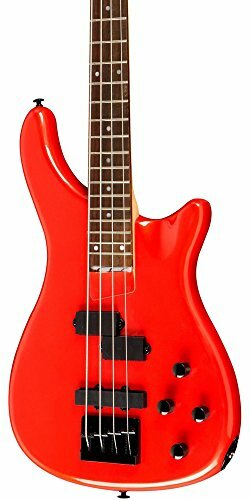 As someone who has a smaller stature, I really enjoyed playing this bass guitar because it was very lightweight, but solid feeling. 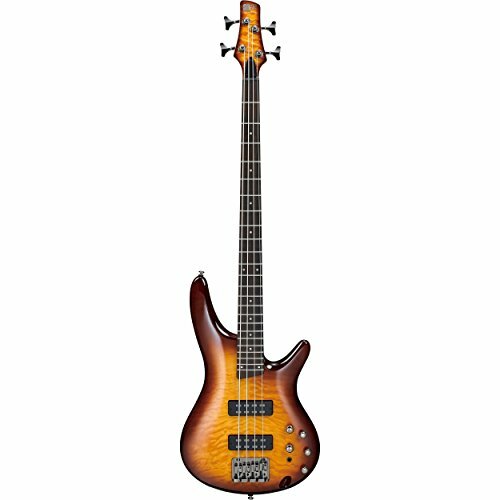 Ibanez produces some great bass guitars, especially from the SR family. 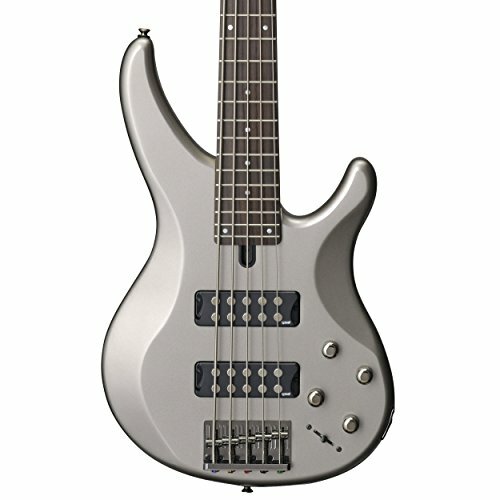 The Ibanez SR400QM is an absolutely amazing bass guitar and is offered at an incredibly reasonable price. The body is comprised from a lightweight mahogany with a quilted maple top, which is great to for any beginning bass guitar player to start learning on. There are two pickups installed in the SR400QM, one CAP EXF-N2 passive pickup located on the neck and one cap EXF-N2 passive pickup located behind the bridge, with an Ibanez Custom Electronics 3-band EQ. 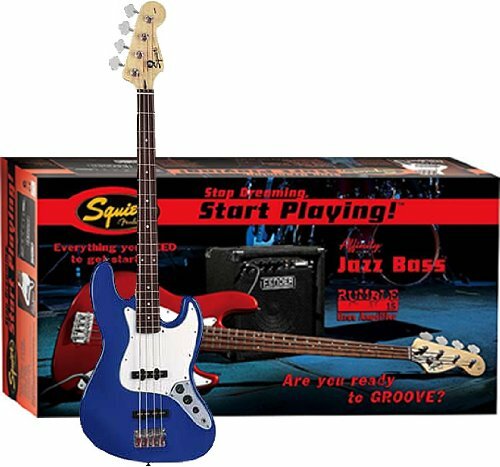 If you’re an absolute beginner to the music world and don’t know all that you’re going to need to start playing bass guitar, the Squier Stop Dreaming Start Playing Bass Guitar Pack is a convenient pack. The Squier Affinity J Bass is a great entry-level instrument that provides musicians with the classic Fender style at an incredibly affordable price tag. This kit comes with a Rumble 15 amplifier, a gig bag, a cable, a strap, a tuner, and an instructional DVD. 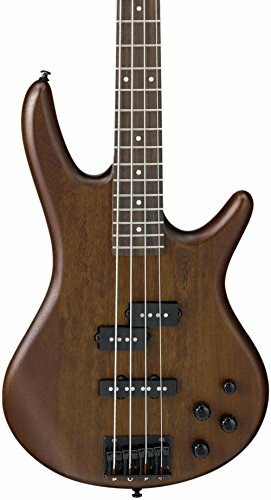 As for the F-104, this is a bass guitar that has a basswood body, a bolt-on maple neck, with a rosewood fingerboard and 24 extra jumbo frets. The pickups on this guitar are SB-4B located at the bridge and the SB-4N which is located on the neck of the guitar, paired with an active EQ. The ESP LTD F-104 produces a smooth metal sound that also fits perfectly into jazz, pop, and alternative. The Dean Custom Zone Bass is a fun guitar to look at because it comes in three unique colors: Fluorescent Pink, Fluorescent Yellow, and Nuclear Green. While the bright colors do make this guitar fun, there are few more surprises that this budget instrument has to throw at you. The Dean Custom Zone Bass has a double-cutaway basswood body, a bolt-on ‘C’ maple neck, a painted maple fretboard, and 20 frets. There is only one pickup that comes with this guitar, a stock precision style bass pickup located at the middle position of the guitar; this instrument sounds surprisingly well for a guitar that costs under $200, is comfortable to play, and fits a variety of music styles. 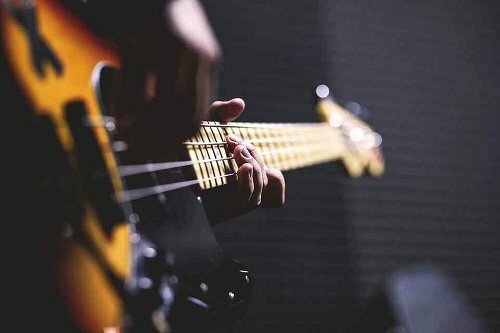 If you’re a beginning musician, you probably can’t find a good reason to justify spending a whole lot of money on a bass guitar, especially if you’re someone who is going to be just a casual musician or you are a beginner musician. This guitar is comprised of agathist, which is a lightweight wood and is paired with a one-piece maple neck.Ibanez got a whole lot of versatility with the sound of this instrument, as they used a Dynamix P split coil located at the neck of the guitar and a Dynamix single coil J pickup that’s located at the bridge of the guitar, paired with an active EQ with PHAT-II Bass boost. This is the cheapest guitar that we have listed here on the list, but you certainly wouldn’t be able to tell that from looks or performance of this guitar! 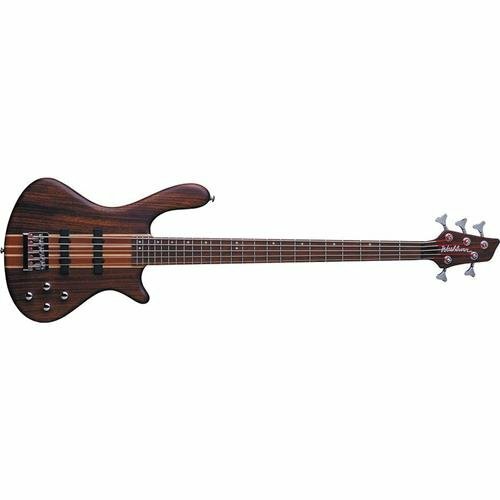 The Ibanez AEB5E is an acoustic-electric bass guitar that makes a great beginner’s bass guitar. This guitar is comprised of an agathist body, a spruce top, mahogany back, mahogany sides, and a rosewood bridge. This acoustic-electric bass guitar produces an aggressive low-end sound, even when unplugged and not amplified. The agathist wood used to create the body really produces a warm sound with this bass guitar. The Ibanez AEB5E also comes with an Ibanez piezo pickup, an Ibanez AEQ-202T preamp with a two-band EQ, and onboard tuners that allow musicians to easily tune their guitar with a more natural sounding amplification. The Rogue LX200B is also one of the other best bass guitars for beginners on the list. The Rogue bass gives musicians a traditional bass guitar look, with a black basswood dual cutaway body. The LX200B also comes with two single coil pickups’ one J-style humbucker pickup at the bridge and a P style split coil pickup at the bridge of the guitar. When playing this guitar, I found that this instrument really responded well to slapping rather than fingerpicking. There are a whole bunch of different options for you to consider when it comes to buying a new bass guitar, whether it’s your very first bass guitar purchase or your 100th! There are a lot of bass guitars to choose from in the world, so make sure that you take your time and test out all of the guitars you’re interested in purchasing! Good luck on searching for your dream bass guitar. I’d bet that among professional bass players, a single Lakland bass would rate higher than every bass on the original article’s list. That would be “Ultimate”.